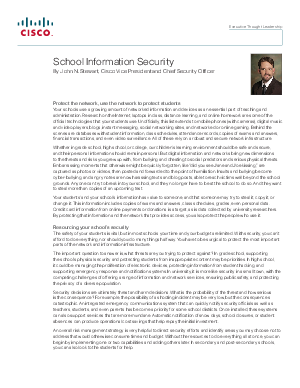 Your schools use a growing amount of networked information and devices as an essential part of teaching and administration. Research on the Internet, laptops in class, distance learning, and online homework are some of the official technologies that your students use. Unofficially, this list extends to mobile phones (with cameras), digital music and video players, blogs, instant messaging, social networking sites, and networked or online gaming. Behind the scenes are databases with student information, class schedules, attendance records, copies of exams and answers, financial transactions, and even video surveillance. All of these rely on a robust and secure network infrastructure. Cisco Umbrella can provides these, download this whitepaper to find out more!